These past couple of weeks have been an absolute blur. I accepted a primary teaching position at Newton College in Lima, Peru, I helped prepare my students for their Malaysian Merdeka Day drama, I finalized a two-day jungle English camp for 60 of my students and I took 10 of my students to a state-wide arts camp at the local university. While more posts are coming with respect to my Newton appointment and my own overnight English camp, I want to discuss the most recent event: the arts camp. Below is a piece I wrote for local news outlets to help get the word out and inform the local Kelantanese of our project. While this is a different approach from the one I normally take, I think it is important to provide the story behind this collaborative project. “During late 2014, the state of Kelantan experienced the worst flooding in recent recorded history. According to some accounts, sixty-eight days worth of rain fell in just two days time. Just over a month after this terrible natural disaster struck, ten Americans (Matt Berman, Rashmi Singh, Becca Rundquist, Kyle Campbell, Addie Schafer, Meg VanDeusen, Keala Pacheco, Hope Jackson, Amanda Baldiga and myself) stepped off the plane in Kota Bharu ready to begin our ten-month English Teaching Assistantship. The English Teaching Assistantship, or “ETA program” for short, is a collaborative program through the Malaysian and American Governments. For the 2015 school year, there are a total of one hundred English Teaching Assistants (ETAs) in Malaysia. Ten of these ETAs were selected to teach at schools across Kelantan. The selected schools, (SMK SRI NIPAH, SMK BADAK, SMK PAK BADOL, SMK PADANG PAK AMAT, SMK TOK JANGGUT, SMK SELISING, SMK SRI MAHARAJA, SMK PANJI, SMK SERING and SMK KEDAI BULOH), were eagerly awaiting their ETA’s arrival. 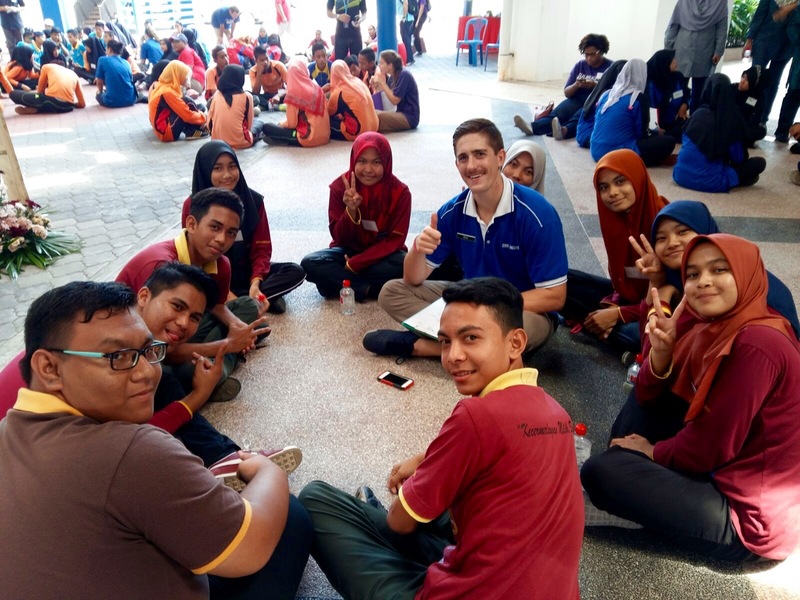 The mission of the ETA Program in Malaysia is to promote English language usage with the ultimate goal of improving students’ proficiency levels. However, the program is also meant to expose otherwise isolated Malaysian communities to American culture. In the same way we learned about The Red Warriors, driving on the left-hand side of the road, and “budu,” our Malaysian counterparts learned about “American Football,” apple pie and pop-music. The ten students from SMK Badak and their two teachers. Despite our purest of intentions and desire to succeed immediately, our first few months in Kelantan were not easy. Not only were we ourselves wrestling with homesickness and adjusting to day-to-day life in our communities, we were also working with students who were incredibly shy and had just lived through a terrible flood. There was a lot of work to be done if we wanted to positively impact our communities and accomplish our goals. But we would not have chosen to teach for Fulbright in Malaysia if we were up for such a challenge. Over the course of the next seven months, we tried everything we could to connect with we students. Introductions were made, songs were sung, games were played, dramas were performed, English camps took place and a lot of selfies were taken. All in the name of progress. Even though most of the students we encountered were unbelievably shy, they did possess the necessary language skills needed to communicate. In this case it wasn’t necessarily a lack of English language content knowledge but a lack of opportunity to use the English language in authentic situations. While it was initially difficult to get our students to open up, after a few months, the once shy and reserved students became strong, confident and capable individuals. As the months went by, we continued to develop our relationships with our students. One of the most revealing characteristics of Kelantanese students is their artistic talent. 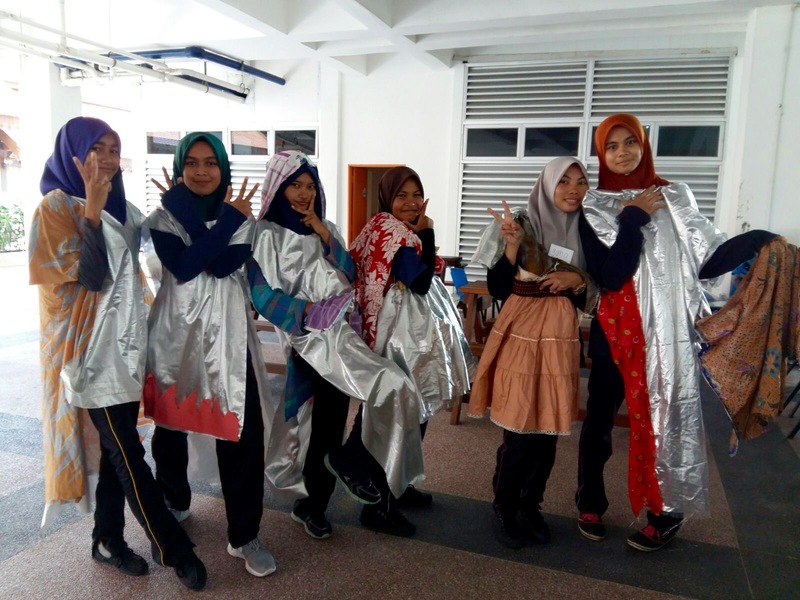 While this may come as no surprise to most Kelantanese, we were amazed to find their students willing to dance in front of their classmates or recite a poem during Sunday formal assembly. Most of us had never heard a traditional Kelantanese poem before and we were incredibly inspired by our students’ confidence levels. As we came to find out, one of the distinctive elements of teaching at a secondary school in Kelantan is the infusion of traditional Kelatanese art forms into the school week. Dikir Barat, Wayang Kulit, Malay poetry and Silat have all been showcased at ETA schools across the state. 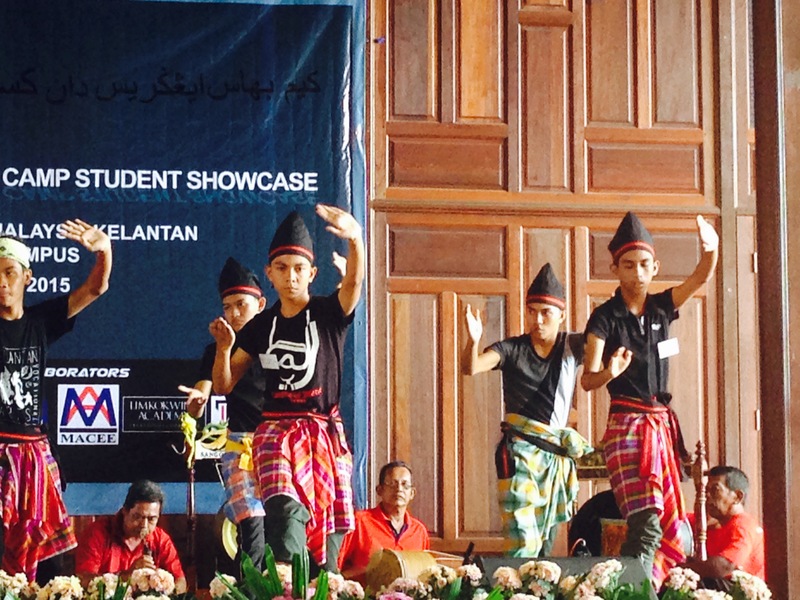 There was no doubt that our students are proud of their distinctive Kelantanese heritage! 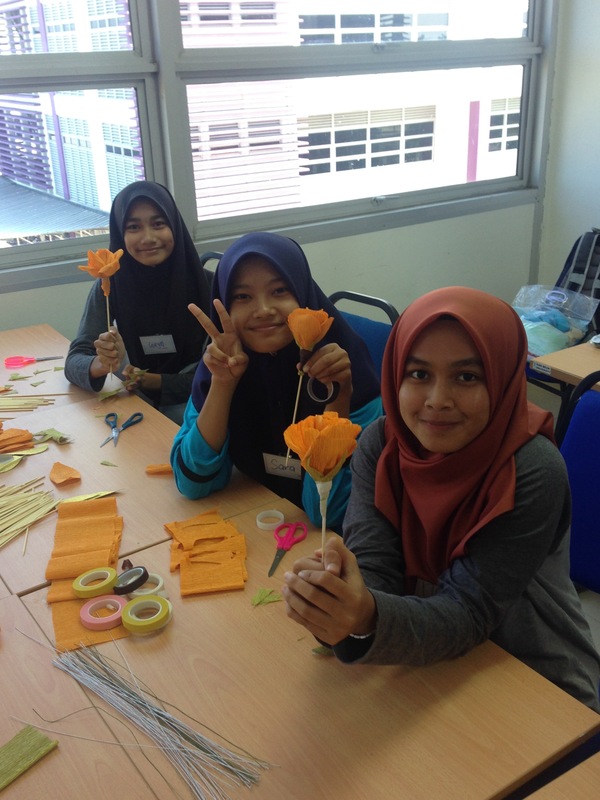 Handmade paper flowers are a traditional Kelantanese handicraft. When you attend a wedding, the newly married couple will present every guest with one of these flowers before they leave. Although there was no wedding ceremony this day, I did still manage to score one! What was even more inspiring for us as ETAs was the fact that our students’ shone brightest while engaging in Kelantanese art forms Those students who may have been unwilling to engage in an English discussion in class were suddenly transformed into confident individuals while performing Dikir Barat. As a result of these observations, we came to a powerful realization: Traditional Kelantanese art forms could help us expose our struggling students to success beyond the classroom. The “culture of testing” that has become increasingly prevalent in American schools has begun to do the same here in Malaysia. While our students must sit for their exams multiple times over the course of the academic year, they must also know that there is more to life than a single exam mark. For many of our students, academic success is not guaranteed. In fact, a number of our students will struggle when they sit for their PT3 (PENTAKSIRAN TINGKATAN 3) or SPM (SIJIL PELAJARAN MALAYSIA) exams. Those students who may possess immense artistic talent should not extinguish their flame in favor of scoring a high mark on their exam. We cannot afford to let this happen. Life is all about finding a balance between work and play. Between what you must do, and what you love to do. We want our students to continue or reignite their love for traditional art forms with the ultimate goal of preserving the Kelantanese culture for future generations. As a result of this realization, we began to brainstorm possible ways to reward and validate our students who truly excel as visual and performing artists. How could we showcase their work and give them the positive reinforcement they need to succeed this year and for many years to come? Thankfully for us, we had established strong connections with Dr. Simon Cooke. Dr. Simon is the Scholarship Coordinator for MAIK (MAJLIS AGAMA ISLAM DAN ADAT ISTIADAT MELAYU KELANTAN) and worked with closely with us when we first arrived in Kelantan. One of Dr. Simon’s initiatives is to promote English language usage within the state. After peaking with him on multiple occasions about our collective teaching experiences in Kelantan, it became clear that he had noticed some of the same things we had, primarily that Kelantanese students knew how to speak English but were too nervous to do so. After many months of discussion and brainstorming, Dr. Simon provided an extremely ambitious yet completely possible idea: a camp focused on promoting Traditional Kelantanese art forms. Knowing that we couldn’t possibly plan, promote and implement this camp without the help of local constituencies, Dr. Simon and members of the ETA cohort began reaching out to some of the State’s most well-known organizations and academic institutions. Dr. Simon reached out to some of the most respected academic institutions in the state, namely UMK (UNIVERSITI MALAYSIA KELANTAN) and they jumped at the possibility of assisting local secondary students and promoting art. Given the enormity of our project and UMK’s renowned faculty, phenomenal facilities and enthusiasm for education, collaborating together made a lot of sense. Not only was UMK gracious enough to agree to house our arts camp, they also agreed to provide access to classrooms and some of their own renowned faculty. My girls looking great in their handmade eco-fashion outfits. After establishing these initial partnerships, Dr. Simon and members of MAIK turned their attention to securing arguably some the most important individuals of the camp: the artists. What would an art camp be without artists? The Kelantan Cultural Centre (Gelanggang Seni) works with some of the State’s most well-known artists. Their network of artists and desire to help our cause allowed us to ensure that our students’ would receive instruction for established artists. MAIK also helped to secure a partnership with Limkokwing Academy of Creativity and Innovation and Taylor’s University from Kuala Lumpur. Including these strong academic institutions helped to provide our students with access to as many excellent academic institutions as possible. Limkokwing is known across Malaysia as a leading graphic design institution and Taylor’s University will be sending students and instructors from their famous culinary school to teach our students how to prepare delicious Kelantanese foods. We are fortunate to be working with such esteemed partners! Their collective efforts highlight not only the value placed on continuing education within Kelantan, but also the importance of art in the State. After months of planning and many a meeting with our partners, the time has come to put our plan into action! On Friday the 4th of September and Saturday the 5th of September, one hundred and thirty students will descend upon UMK Bachok and experience two full days of artistic immersion. Students will have the chance to learn about Dikir Barat, modern and traditional Wayang Kulit, Wau, Batik making, Mak Yong traditional dance, Silat, eco-fashion design based in Kelantan ideals, traditional poetry, animation, and handicraft work producing wedding bouquets called Sireh Junjung during an initial session on Friday. After this initial session, each student will select two art forms to experience further. Over the course of the two-day camp, each student will produce a piece or two of visual art or learn a performing art routine. In an effort to really validate and recognize our students’ efforts, they will have the chance to display their visual art and perform their learned routine during a student showcase on Saturday. Select pieces will then be displayed at culturally significant locations over the next few months. Silat is a traditional Kelantanese form of martial arts. Needless to say, this was extremely popular amongst the boy participants. Over the course of the two-day camp, I spent as much time as I could with the students participating in the camp. Reflecting back on my own schooling, I remember field trips and overnight camps as the times that I really solidified my relationships with my friends and my teachers. Keeping those memories in mind, I did everything in my power to bond with my students: I ate with them, I joked with them, I silently watched them create magnificent pieces of art, I praised their efforts whenever I could and I said “yes” to every single impromptu photo shoot. I wanted my students to know that I recognized the courage it took them to come to a camp with 120 other secondary students. I wanted them to know how proud I was of them for taking full advantage of this unique opportunity. For these two days I was a teacher, a coach and a friend. Watching my students’ flourish during the two-day arts camp was an experience I will not forget. Thumbs up and smiles for an amazing weekend!